Let me start by saying that this was by far the most challenging cake I’ve ever made. 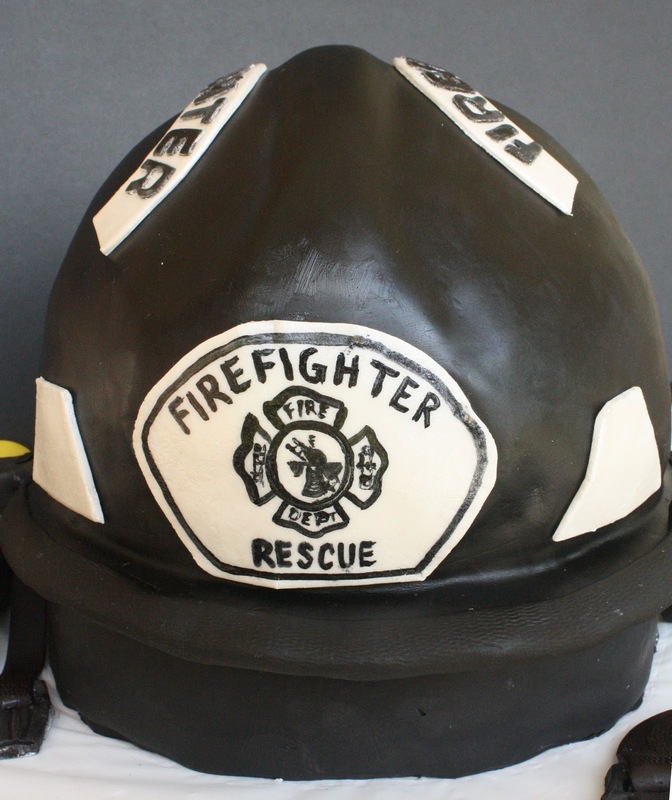 The bride-to-be requested A Fireman’s Helmet Cake for her groom. 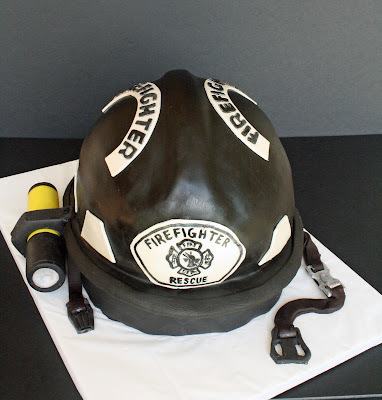 But not just any fireman’s helmet. She wanted details. Lots of details… and she wanted it as “real” as I could get it. Well. that made me a little LOT nervous! 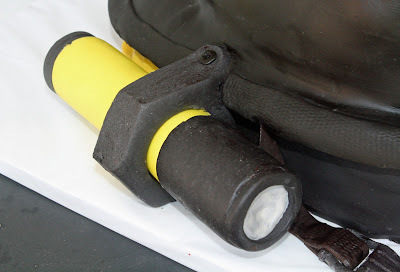 Before I get too far, I’ll tell you that this entire cake and all the decorations were edible (except the inside of the flashlight – it was a cardboard tube). 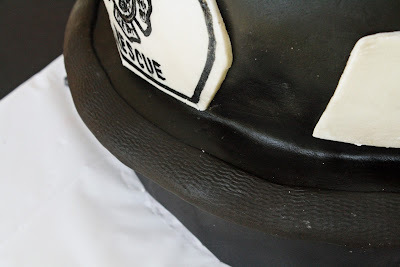 It was all red velvet cake, filled and frosted with vanilla buttercream then covered and decorated with Satin Ice black fondant, Satin Ice Dark Chocolate brown fondant, and homemade marshmallow fondant (for the white, yellow, and silver decorations). I know you might be wondering about me using the store-bought fondant, since I almost always make my own, but after several very unsuccessful attempts at chocolate/brown fondant and knowing that I need a lot of black fondant (way more than usual), I opted to buy it this time around and I was very pleased with it! The Satin Ice black fondant has a very pleasant flavor (especially for black which usually tastes awful) and the Dark Chocolate/Brown fondant smelled and tasted delicious!! So, about those instructions I mentioned in the title, for those of you who might one day want to make a fireman helmet cake, here is a run-down of how I did it! This was my first time and I’m sure somebody out there has a better way of doing this! I certainly learned a few things from this cake – but maybe it’ll help somebody!! Because the bride and groom wanted the flashlight hanging on the helmet, the yellow fabric hanging from under the back, and wanted it as “real” looking as possible, the first thing I realized was that I needed to elevate the helmet. I did this by baking a 13.5 x 9.8 inch oval cake to use as a base. 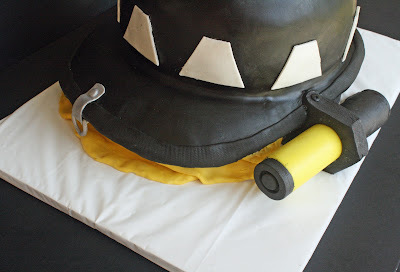 I covered it about halfway with yellow fondant and half with black. For the back, I deliberately let the yellow hang and fold onto itself so that it looked (hopefully) like the fabric hanging from the real helmet I had as a model. After I took these pictures, I even went back and used a tiny wheel (from this set) to add “stitching” to the edges to make it look as if it were sewn. Anyway. 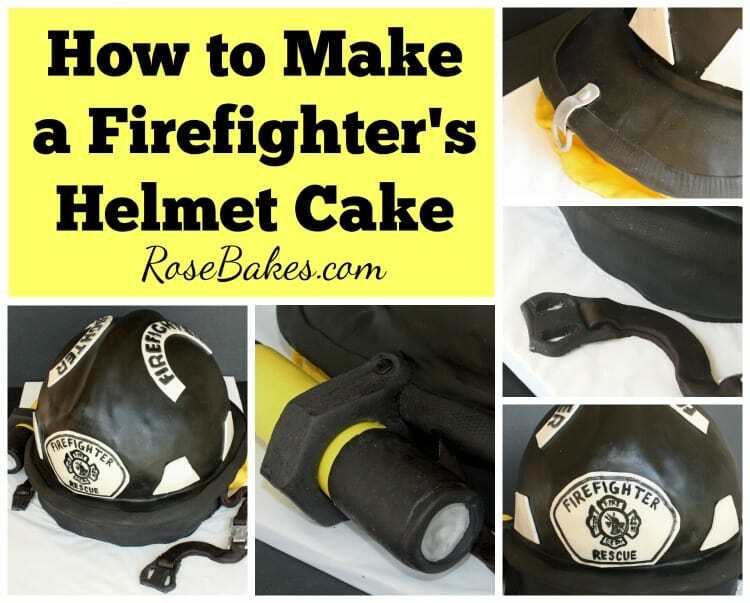 For the brim of the helmet, I started by carving a piece of Styrofoam to use as a “mold” for the brim (my husband was a huge help with this… I couldn’t have done it without him!!). I then wrapped that in plastic wrap and dusted generously with corn starch. The picture below was taken after I was done… the plastic wrap had leeched some coloring from the black – turning it pink! Next, I took out a ball of black fondant, added lots of Tylose powder to it, rolled it out into a huge oval and cut it to fit on my “mold”. I allowed this to try and harden for over a week! Actually, it was less than a week because the first one I made cracked in HALF when I was “checking” it a few days into the process… so I started over a couple of days later. I guess the final one dried maybe 4-5 days?! For the rounded part of the helmet, I baked two 10″ round cakes and one cake in the Wilton Soccer ball pan. 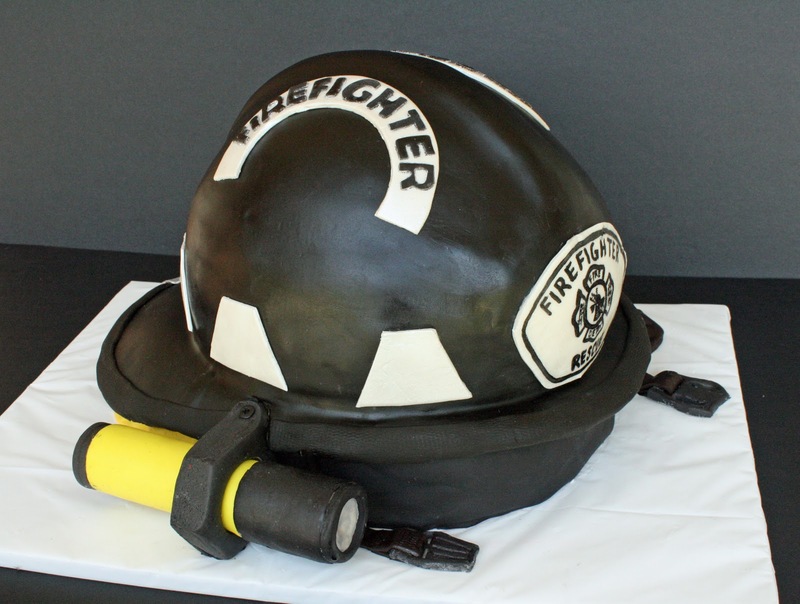 I really didn’t need nearly the height of all that cake – I ended up carving off about an inch of the soccer ball round cake and probably more than an inch off of one of the 10″ rounds… and it was still about half an inch taller than the real helmet. I also carved some off the sides to give it a slightly oval shape instead of perfectly round. 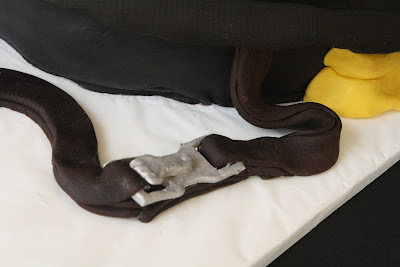 For the straps, I rolled out Brown fondant and cut it with a ribbon cutter, then used a clean (new) piece of nylon strap to make the texture right that I bought at Hobby Lobby. 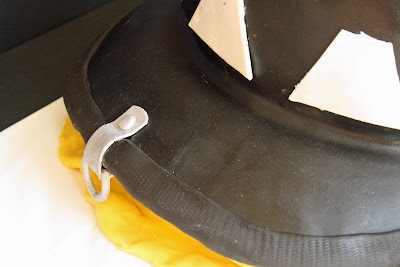 I also used it to texture the edging on the brim of the hat once I got it attached. For the buckles, I just hand cut them to match as best I could and let them dry for a couple of days. When I got around to assembly, I looped the (still soft) brown straps through the holes, folded it under and “glued” it so that they’d look like the real straps. When it was done, the buckles were actually moveable on the straps because they were separate pieces… it was pretty neat (although not much moving was done… I was way too nervous to be playing with them!!). For all the brackets and buckles, I used white fondant and gum paste (or black for the black buckles on the ends of the chin straps). After they dried, for the silver ones, I mixed Wilton Silver Pearl dust with some vodka and painted it on. The vodka all evaporated away leaving a silver finish! I used the same method on the stickers on the helmet, except I used Wilton White Pearl dust to imitate the reflective white finish on those (although it was hard to see in the pictures). For the flashlight, I used a 1″ cardboard tube and wrapped it in the fondant. I added the button on the end and used the Silver Pearl dust for the “light”. 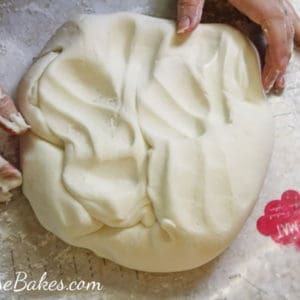 To get those sharp edges on the flashlight holder, I took a huge thick ball of fondant, slightly flattened it (to about 1″ thick) and used a big knife to cut away the fondant at angles to leave those “corners”. 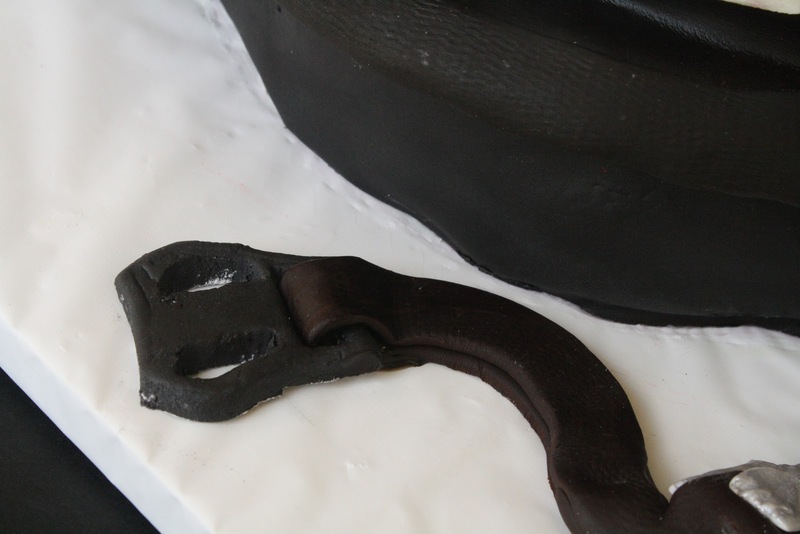 Also, I left the flashlight and the bracket/holder separate to dry until it was time to assemble the cake and I slid it in (with a little shortening to act as a lubricant since the hole on the bracket shrank a little when drying…oops). For the final assembly, I first put the oval cake on the board (then covered it as described) and inserted some cut bubble tea straws for support. Next I spread some buttercream on that and laid a 9″ cardboard round on that with more buttercream on top, then the large flat dried piece of fondant on it (with the brim/edges hanging over). Then I put the 10″ round cakes and the ball cake on top of that (already filled, assembled and carved). I also used bubble tea straws in the 10″ rounds for support underneath the ball cake. After all that, I put a generous layer of buttercream over the entire ball. To get the “ridges” on the helmet, I shaped a piece of fondant into a long rectangle and cut the edges to give them sharp corners and to give it the length needed. I then laid it on the cake and used my fingers to smooth down (taper) the ends to match the helmet. 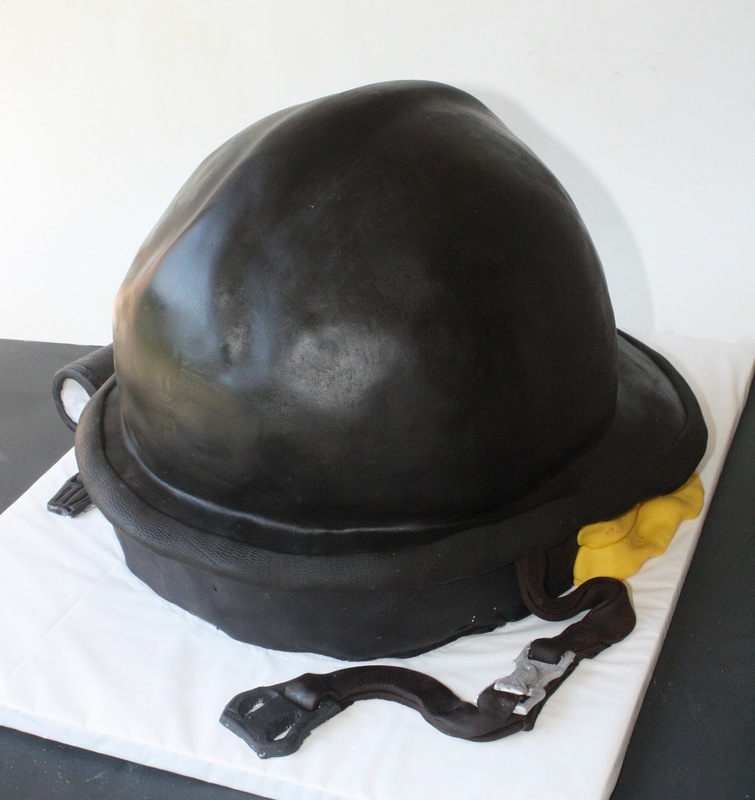 Once that was shaped like I wanted, I rolled out and covered the entire helmet with black fondant (including the brims). I had it big enough that it went a little over the edges of the brim. Can you see that ridge a little better in this pre-sticker picture? After that, I cut long strips of black fondant (about twice as wide as I needed it) and I folded it over the edges (under and over) to create the edge and then I textured those. When all of that was done…. I added the details…. the stickers, the brackets, the straps and the flashlight. For the stickers on the side, the letters were larger, so I used these Wilton letter cutters, but I cut the tops and bottoms to make them more square! So, that’s that. I’m just tired typing all of that out! I really wish I had taken pictures throughout the process so that I could show you how I did it! 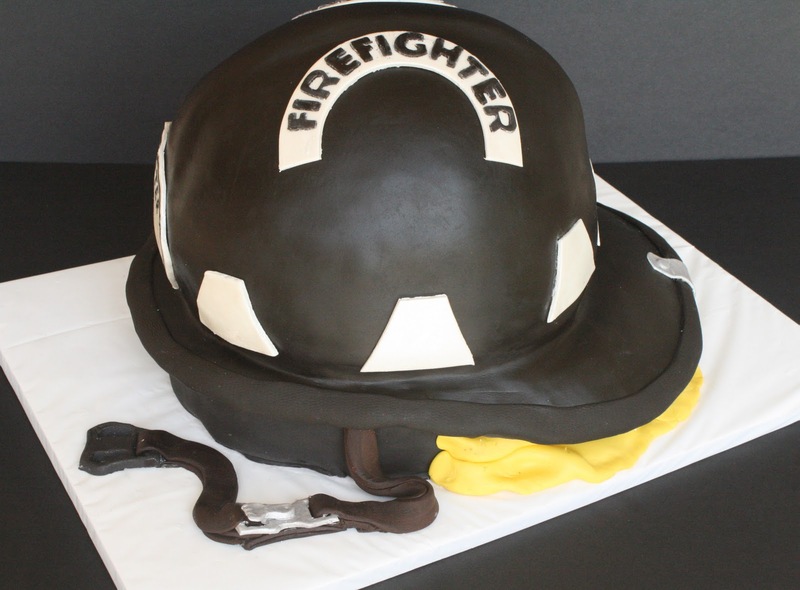 But either way, there you go – A Fireman’s Helmet Cake!! I think you did an amazing job! 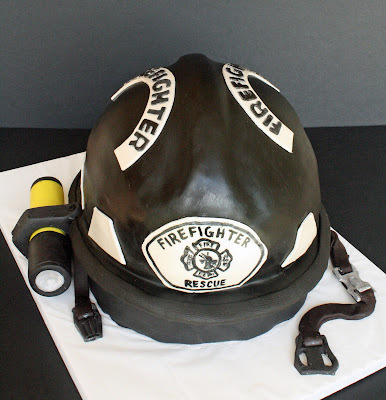 My husband is a firefighter and he would love this!